When you want something done well, the saying goes, ask a busy person. That’s certainly proven true for three teens, who each have made time between studies and extracurricular commitments to tackle a fundraising and iPod donation drive for MUSIC & MEMORY®. Jake Moskowitz, Callie Shirley and Daniel Zeuner have never met, but collectively, they’ve raised nearly $10,000 and collected more than 40 iPods in recent months. What convinced each teen to get involved? For starters, all three love music and play instruments—Jake plays the drums; Callie, piano; and Daniel, guitar. For another, both Jake and Callie were inspired to get involved with Music & Memory by beloved grandparents who have struggled with Alzheimer’s. All share a commitment to bettering the lives of those around them. And as they have become more involved in fundraising and iPod donation drives, all three have discovered an unanticipated reward for their efforts: Raising funds for Music & Memory is surprisingly easy. “I never imagined I could raise so much in such a short time,” says Jake, 16, who has garnered more than $7,400 from his fundraising efforts since May. Jake and his mother contacted Alexis Gregos, Music & Memory’s Community Outreach Coordinator, for suggestions about how to get involved and learned about the Tuttle Center, a MUSIC & MEMORY® Certified Care Facility at The Amsterdam at Harborside, near their home in Port Washington, N.Y. So, despite year-end exams and other commitments, Jake set to work—creating a Razoo online campaign for fundraising, as well as volunteering at the Tuttle Center to create an iTunes music library for personalized playlists. In addition to writing a letter about what he was trying to accomplish with his Razoo campaign and emailing it to about 100 family members and friends, Jake also approached the head administrator at the School of Rock and his drum instructor there about his fundraising effort. His teacher had been looking for a good project to sponsor for an upcoming performance, so Jake took up the challenge. With a table at the spring concert that sold $20 raffle tickets (prizes included music lessons and an iPod Touch), he collected more than $1,800, as well as a handful of gently used iPods and iTunes gift cards. And the Razoo campaign? “We’ve raised $5,500, and we’re still going,” says Jake. “I’m very proud, very happy. My grandmother is aware of what I’m doing, and she’s very supportive.” As he enters his junior year of high school, Jake intends to continue volunteering at the Tuttle Center. That experience convinced Callie to promote Music & Memory as her platform when she entered the Miss Mississippi beauty pageant this past year, aiming for the title of Miss America. Winning the title of Miss Mississippi College was her first step in the competition—her talent, of course, was piano. Callie Shirley at the piano. For several months prior to the Miss Mississippi competition in June, Callie visited communities and nursing homes near Jackson and explained the benefits of personalized music for people with Alzheimer’s and other dementias and cognitive challenges. In the process, she connected with St. Catherine’s Village in Madison, a MUSIC & MEMORY® Certified Care Facility, and began to volunteer, helping residents listen to their iPods. She held iPod donation drives at her college and local elementary schools. In addition, leveraging her Miss Mississippi College title, Callie set up information booths at community events. “When little girls would come up to get my autograph, I’d hand them a brochure for Music & Memory and tell them to give it to their moms,” she says. The result? So far, Callie has collected $1,500 and 20 gently-used iPods. Although Callie didn’t win the title of Miss Mississippi, she did receive a Women in Medicine Scholarship to pursue her nursing studies at Mississippi College, as well as a non-finalist talent award for her piano performance. For Daniel Zeuner, 13, raising money and collecting iPods for Music & Memory was the perfect project for his bar mitzvah this past June. A middle-schooler at the Abraham Joshua Heschel School in Manhattan who loves to sing and play guitar, Daniel was hooked after watching the Henry video with his mother, Julia, a geriatric social worker who has worked with many Alzheimer’s patients. With guidance from Music & Memory staff, Daniel and Julia set up a Razoo campaign and sent an email letter to family and friends coming to the bar mitzvah. Daniel set up a box at school for donated iPods, and bar mitzvah guests were also encouraged to bring them to the celebration. 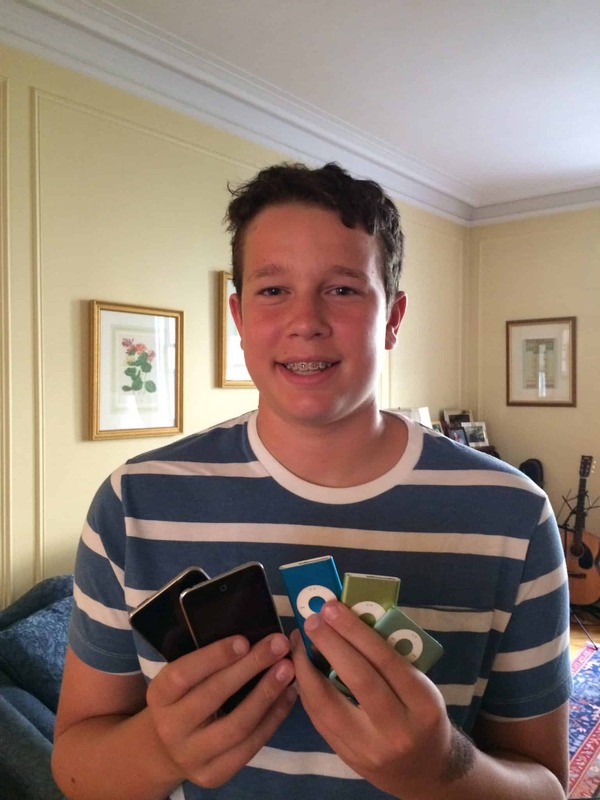 To date, Daniel has raised over $1,400 and collected more than a dozen used iPods. “The best part was seeing how supportive everyone is,” he says. To other teens, Daniel recommends an online campaign as an easy way to raise money as well as awareness. He also says it’s good to give people a choice of donating funds or iTunes gift cards, as well as iPods, so they have options. When Callie Shirley handed out autographs as Miss Mississippi College, she also gave her young fans Music & Memory brochures for their moms. Rewarding as it can be to hold a successful fundraiser for a good cause, perhaps the greatest reward comes from volunteering directly with those who benefit most from personalized music.